Isn’t that how we approach life sometimes? We think, “Why bother? Why me? Why now? Who’ll watch it? Who’ll listen to it? Who’ll read it? Who’ll sing it? Who’ll love it? Who’ll like it? Who’ll hate it?” We come up with a 1,001 reasons to do absolutely nothing. And the world suffers because of it. So why not take a queue from the man that 1,264,751 other blogs are honoring today and stop thinking all those negative thoughts and…think different (you knew it was coming). Why bother? Because it may change ONE life today. Why me? Because if you don’t, who will? Why now? Can you think of a better time? Who’ll watch, listen, read, or sing it? That one person who needs to. Who’ll love it? Why does that matter? Who’ll hate it? Why does that matter? So, for the one person out there who just happens to read this blog today among the millions others, first I thank you, second I implore you…let’s commit to be insanely great. “Insanely great” is the term Steve so famously used to describe the kind of products Apple would make. “Good enough” would not be. Another famous marketing line from a legendary technology company was HP’s “What if…” It challenged us to imagine beyond our wildest dreams. I was reading a Wired Magazine article about Steve just the day before his death, and it referenced an early interview with him giving praise to HP. He and Apple co-founder Steve Wozniak used to work there, and they were greatly influenced by how HP was run and was built. Like Apple, HP was also famously started in a Silicon Valley garage, and its founders were visionaries, as well as humanitarians. 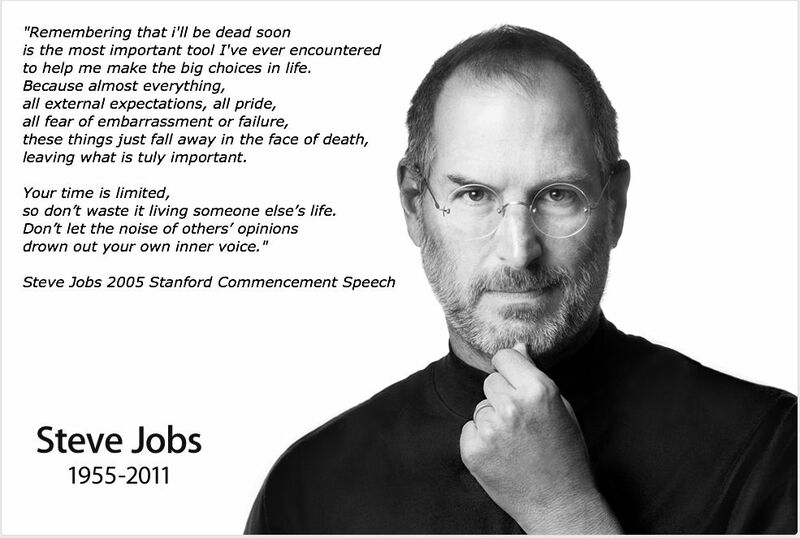 Steve was more than just a CEO, a visionary or a technology genius. He was an artist. And as a visionary artist, and as someone who many have called the greatest CEO to ever live, he has inspired so many other artists and business men and women to make their art and their products or services insanely great. But why stop at products and services? What if… the way we loved our spouses was… insanely great? What if… the way we hugged our kids was… insanely great? What if… the way we listened to our friends… was insanely great? What if… the way we gave to others was… insanely great? What if… the way we kissed those we love was… insanely great? What if… the way we took care of our bodies was… insanely great? What if… the way we led every aspect of our lives was… insanely great? Let’s commit one day to being insanely great. And if that day works out, try two. Then three. Then see what happens after that. Again, thank you for this my brother. It’s not just about success in what you do, but in who you are, the lives you touch. My life’s mission is to do great and relevant work in small and big ways and it’s a never ending quest. That’s why it’s my LIFE’S mission. Thank you. Thank you for reading Andrew. Trek on! Thank you so much Ron for blog number 1,264,752. As with so many of your other writings, it’s a KEEPER! I did not read all 1,264,751 million blogs about Steve Jobs but I did happen to read quite a few. I have to say, yours was the best. Thanks for taking the time to write and post your thoughts. Wow Karen. That’s such a compliment. Thanks so much. I was quite in shock when I heard the news. Thanks for taking the time to read mine. Loved the post today Ron! Printed, highlighted and posted on my board. Great reminders to look at and gain perspective. Yes, why stop at products and services? Thanks for an insanely great blog post, Ron! Yes! Don’t just live insanely great, love insanely great. Ron, I have to give a hearty amen! Companies and products can have a lasting impression, but those last set of What ifs are what truly matter in the end! And doing it for the glory of God make it kingdom lasting!